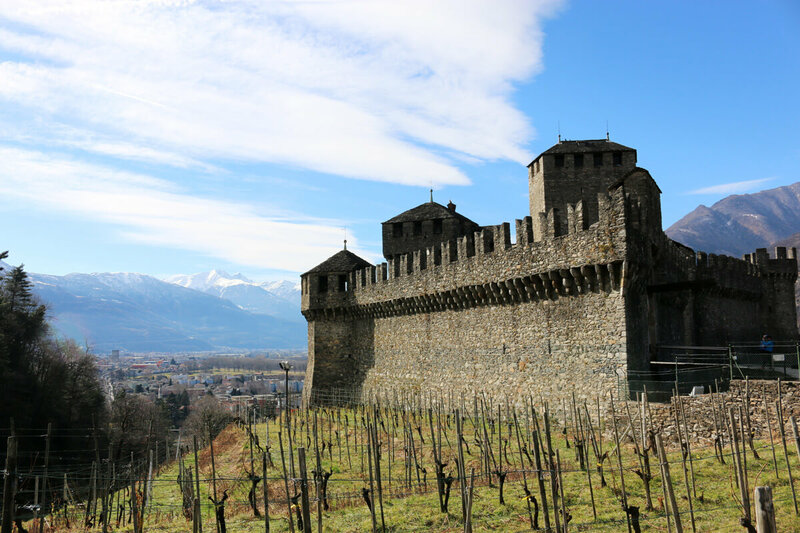 Back in Roman times and up through the centuries, Bellinzona has served as a gateway city. Due to its strategic location just south of the alpine passes, three castles were built by the Dukes of Milan to serve as fortifications against tyranns: Castelgrande, Montebello and Sasso Corbaro. Today, Bellinzona is the capital of the canton of Ticino and is once again an important element along the north-to-south transportation axis. 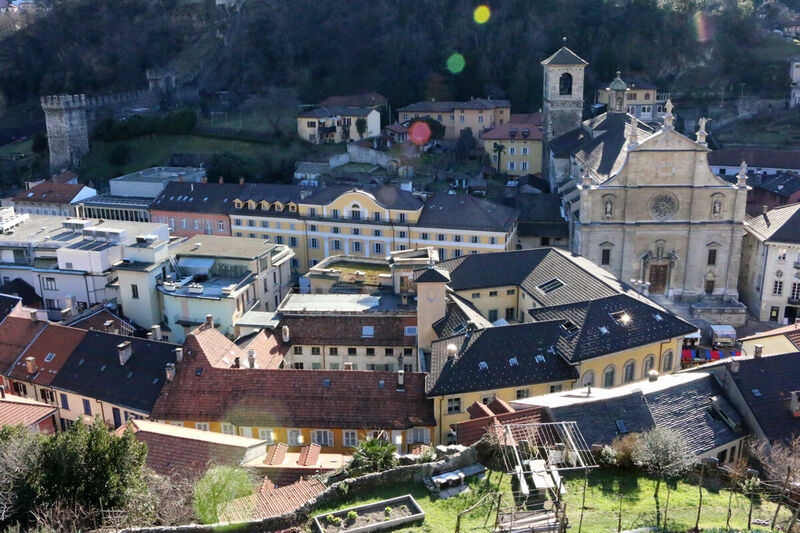 Whether by train or by car, we routinely stop in Bellinzona when traveling to Ticino. Saturday is our favorite weekday in Bellinzona because it is market day. 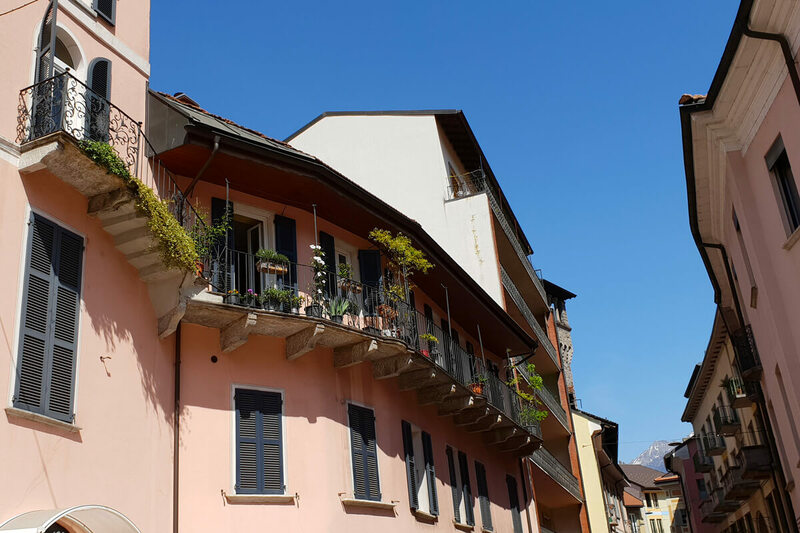 In this visitor's guide, I would like to share some tips for first-timers so that you can get the most out of Bellinzona. 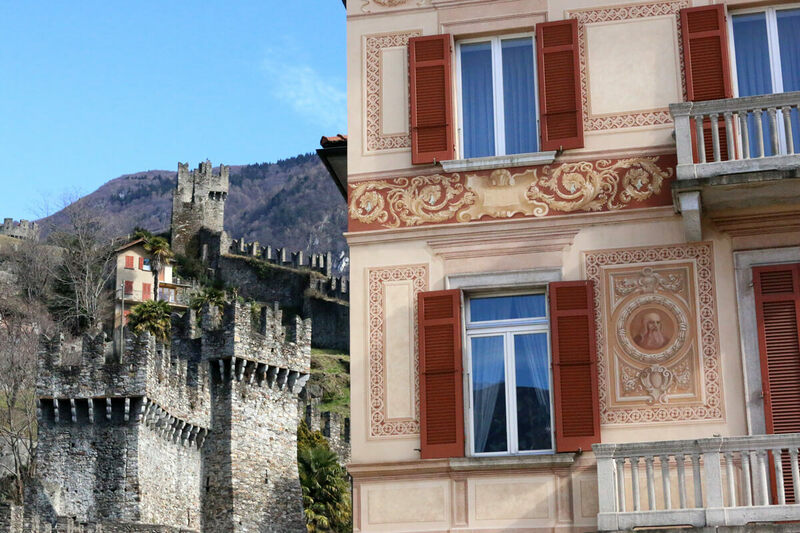 Bellinzona's charm is scattered all over the old town. Imagine colorful buildings, southern charm and Italian lingo: what else can you ask for provided that Bellinzona can be reached from Zürich by train in as little as 100 minutes? In no time, you will feel like on vacation somewhere in the south. If you time your visit for a Saturday, even better. This is when the weekly farmers' market takes place all over the old town. Deli meats, raw cuts, fresh fish, alpine cheese, dried herbs, organic vegetables, pastries, bread and polenta a go-go... You name it and you can probably find it! Simply let your nose guide the way and you will surely feel satisfied by the time the church bells ring at noon. Together, the three castles comprise a unique UNESCO World Heritage site. The mighty walls, towers, battlements and gates of these imposing fortresses never cease to astonish us. So far, we have only visited the museum at Castelgrande. But in fact, each of the castle houses its own museum. There, you will notice a signpost directing you to Montebello. Fifteen minutes describes the walk quite well as it is going to be up, up and up! The trail will lead partly through the old town, then climb the hill alongside shrubs and a vineyard. For another day, there's a Tibetan hanging bridge in Curzútt above Bellinzona. 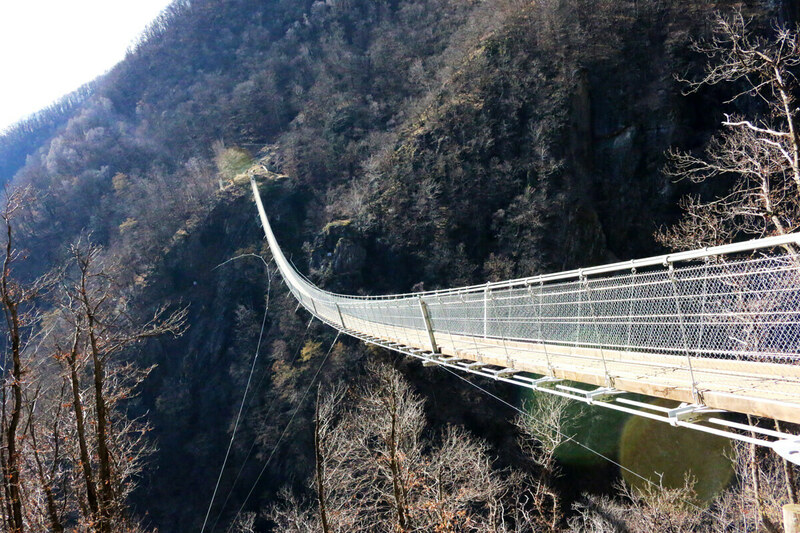 In case you like adventure, how about a walk across a 270 meter long suspended bridge? The Tibetan bridge in the small stone village of Curzútt above Bellinzona is definitely worth a visit. Actually, you could easily call crossing this bridge a bucket list thing to do - it takes some guts! 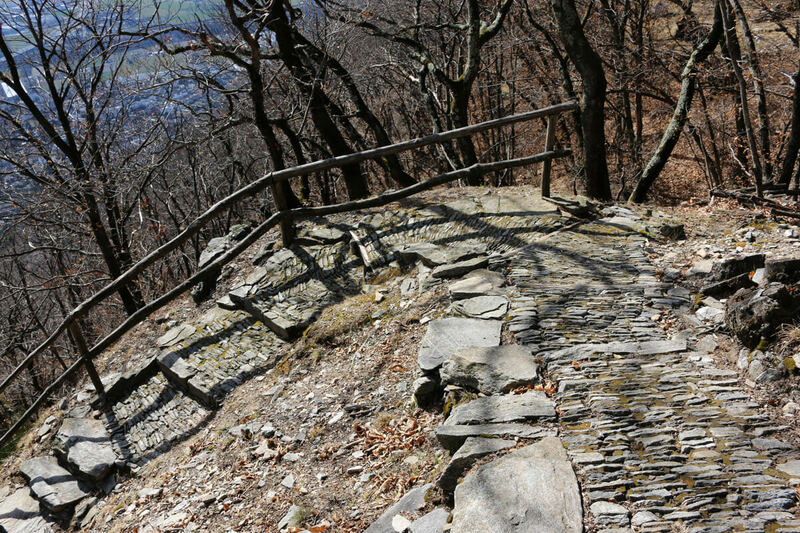 Your starting point for this hike will be the cable car station at Monte Carasso, which is about 2 km from the courthouse in Bellinzona's old town. Even better, catch bus 311 to "Monte Carasso, Cunvént". To avoid having to wait in line at the vending machine, reserve your cable car slot ahead of time.